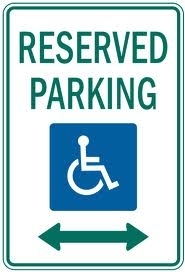 The board’s current project is an initiative – to make driving and parking a little easier for the township’s residents who have disabilities while raising awareness of the ADA’s efforts. The ADA board members plan to sell car decals bearing the recognizable wheelchair symbol; along with a brief message of support from the board to residents who already have the disability access placards or license plates issued by the state Motor Vehicles Commission. The decals would be sold for $3 and will also help raise awareness of the ADA board’s efforts to increase accessibility to facilities all over the township. The board is always on the lookout for places to make improvements, whether its ramps or wheelchair-accessible port-a-johns at township ball fields. If the initiative is approved by the township administrator David Breeden, the ADA board hopes to start selling the tickets within a month, and offering them for purchase at the township’s municipal offices and at public events to residents who show their state-issued disabled person ID cards. Barnegat Monthly Advisory Meetings are held every Third Wednesdays. A Cheerful Worker Raises Everyone’s Spirits!